Going into any classroom today and looking around, everyone will be amazed at the sheer volume of printed material being used. From the books to the notepads, handouts, display documents in various sizes and the teaching aids, the variety, color, and the volume does not seem to have declined even though we are in the Digital age where many schools are using more and more electronic tools like computers and tablets. We all know that schools are all being squeezed with their budgets, but if you look closer you will see that the use of Synthetic documents is on the rise! How could this be? A common challenge with children and adults with autism spectrum disorders is their ability to communicate with others. 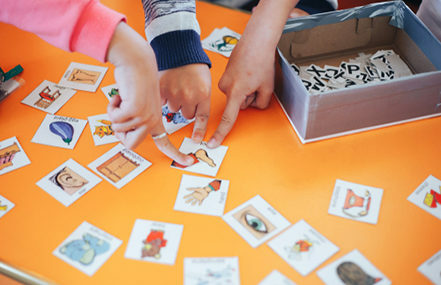 Photo language cards – flashcards, act as visual supports and are an excellent way to engage with children while increasing vocabulary, promoting language development, and strengthening communication skills. An issue with these cards is that many are placed in student mouths which ultimately damages them causing frequent replacements. The first answer was to laminate these cards but that became a problem due to the ease of delamination, additional costs to reproduce and the cards became very thick and difficult to handle. The solution – use the 11mil/270micron KernowPrint product which could be easily cleaned with sanitizers many times a day if necessary. By being thinner yet as rigid, the KernowPrint product is much easier to use by both student and teachers, it is easier to produce as you skip the laminating step, ultimately saving time and money for the schools – everyone wins! Most schools still give out hardcopy student planners for the school year in order to create organization and better communication. With these planners being a part of the classroom experience, students are more likely to keep track of their assignments, set personal goals and enhance communication between teachers, students and parents. One problem KernowPrint helped solve for many schools was that many of these planners were being damaged by excessive daily use by being roughly handled in lockers and backpacks. The answer was the use of 14mil/350micron KernowPrint product for the covers to protect the planners. Not only will the planners be more durable, they can even be personalized with the students names and by the schools with their colors and logos to help foster school spirit. Reading a ruler has always been an essential skill children learn in school and some schools have expanded the simple ruler to support the students in their education. We have seen numerous schools provide our KernowPrint solution to their students by way of various customized rulers which have a variety of helpful data included like multiplication tables, list of Presidents and conversion charts to act as a fun reference guide and support the student’s learning. Schools have used our 14mil/350micron solutions as a great resource to promote the schools and offer another tool in helping the students learn without them being aware. Using Kernow Synthetics within the Education Market for endless solutions helps schools save both time and money and supports them to improve the children’s experience and education. The wide variety of KernowPrint solutions which are tear proof and alcohol resistant are a perfect fit for the education market. To learn more about how KernowPrint Synthetic Print Media can help you elevate your prints and drive home new business within the education market, contact Kernow today at sales@kernowcoatings.com. Our team of experts can help you develop the best applications with the perfect material to leave your customers wondering why they didn’t ask you sooner!